Explore the rich diversity of one of the fastest-growing fashion sectors today. Discover the complex, diverse nature of Muslim dress codes worldwide. The exhibition examines how Muslim women—those who cover their heads and those who do not—have become arbiters of style within and beyond their communities, and in so doing have drawn mass-media attention to contemporary Muslim life. Spotlighting places, garments, and styles from around the world, this exhibition considers how Muslims define themselves—and are defined—by their dress, and how these choices can reflect the multifaceted nature of their identities. The exhibition traverses different religious interpretations and cultures and includes high-end fashions, such as those by Malaysia-based Blancheur; streetwear, such as modest designs from London-based Sarah Elenany; sportswear, such as the burkini; and commissioned garments from both emerging and established designers. You’ve never seen an exhibition like this. From streetwear to couture, watch now to discover the designs featured in "Contemporary Muslim Fashions." The exhibition’s introductory gallery orients visitors to this multifaceted topic through the display of contemporary Muslim modest fashions, social media content, and press and news clippings. As Islam is a multicultural faith, the dress of its practitioners is shaped not only by religious principles but also by local customs and traditions and global fashion trends. This dynamic display showcases the diversity of voices in the Muslim community—from style arbiters and bloggers to emerging designers, politicians, and athletes—and introduces visitors to the types of content and artworks that they will see throughout the exhibition. The complexity of this topic will be explored by contrasting high-end fashions, such as those by Yves Saint Laurent and Faiza Bouguessa, with socially charged artworks. The exhibition galleries, designed by Hariri & Hariri Architecture, explore the interplay between the seen and unseen, and the idea of being covered and protected as well as contemporary and fashionable. Working from a premise that the holy texts of Islam have been interpreted in multiple ways around the world and across time, the exhibition’s second section explores approaches to head covering around the world. Through contemporary art, documentary, and fashion photography, this display features examples of different types of Muslim coverings, including the hijab, burka, turban, and headwrap, as well as more recent commercial propositions, such as the sports hijab. These are featured with photographs, news clippings, and videos that explore the cultural contexts in which these garments are worn. In recent years, there has been increased awareness of Muslim dress as an important segment of the global fashion industry. This has perhaps been most evident in the emergence of modest fashion weeks to promote the work of both established and emerging designers who adhere to Muslim design aesthetics, as well as by the shift among both Western and non-Western designers to create styles specifically for Muslim clients. For many Muslims, dressing visibly Islamic and highly fashionable is also a way to promote a positive awareness of their culture amid ongoing anti-Muslim prejudice. The exhibition’s main galleries explore these developments throughout the world by regional survey, with the first section focusing on Muslim majority countries in the Middle East, such as Dubai, Saudi Arabia, and Kuwait. Designers from this region include Faiza Bouguessa, Mashael Alrajhi, and Wadha Al Hajri. One feature of this display is the abaya—a loose robe-like overgarment worn especially in the Gulf—to explore how contemporary abaya designers meld regional aesthetics with the global trends of the fashion industry. Although Turkey led in the commercial design and manufacture of Muslim modest fashion in the 1990s, today the global reach of Islam is evident in South and Southeast Asia as well, where Indonesia has emerged as another leader in the modest and Muslim fashion industries. The rich textile and costume traditions of this region, especially in Indonesia, greatly inform the designs produced for these sectors, as evidenced by the use of luxurious fabrics, vibrant colors, and complex patterns. Designers in this section include Blancheur, Itang Yunasz, Dian Pelangi, and Bernard Chandran. Experiences of migration and relocation by Muslims have also helped shape their religious practices and dress codes. As a few of many examples, these developments are evident in garments made by Muslim immigrants now living in Europe, such as in the United Kingdom, where designers, such as Saiqa Majeed of Saiqa London, merge the textile heritages of their countries of origin with Western fashion and modest dress aesthetics. In the United States, designers from the Nation of Islam, such as Carmin Muhammad of Al-Nisa Designs, are creating clothing that adheres to the tailored shape and silhouette of their traditional dress as well as contemporary interpretations of modest aesthetics. 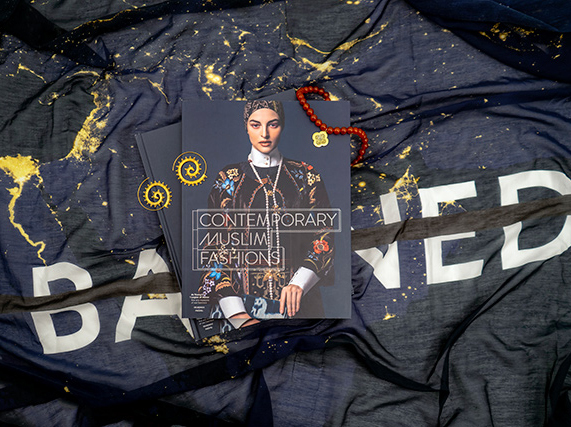 To explore the rise of Muslim consumer culture, a section of the exhibition will showcase affordable luxury and fast fashion, such as designs by Sarah Elenany and Barjis Chohan, which cater to a Muslim clientele. These fashions demonstrate how younger generations of Muslim women are creating wardrobes that allow them to mediate contemporary society while being true to their faith. A subsection of this gallery explores the rise of hybrid sportswear garments that have helped foster Muslim female autonomy, such as the burkini. The exhibition’s final section explores high-end fashion designs that have been customized to accommodate Muslim women’s diverse modesty considerations. Since the second half of the twentieth century, elite Muslim clients have been important patrons for the couture houses of Paris, where designs were often adapted for regional and religious sensibilities. True to the spirit of couture, this industry has long shown a willingness to modify its creations to suit the needs of clients who wish to dress modestly. Today, this tradition continues among the Western fashion design houses, such as Oscar de la Renta, that have created special collections for Ramadan and Eid, as well as online luxury retailer The Modist, which collaborates with a broad array of international brands to adapt styles for concerns of modesty. In celebration of Contemporary Muslim Fashions, the de Young Museum Store is featuring apparel, accessories, and other items from noted Muslim designers and artisans from around the world. Meet the designers and entrepreneurs making sure modest fashion is more than just a trend. We sat down with members of the Teen Advisory Board to talk about "Contemporary Muslim Fashions". Stylistic choice plays a significant role in Muslim self-fashioning in the United States. Additional Support is provided by Richard and Peggy Greenfield, and Robin Rosa Laub, and the Neda Nobari Foundation.